Anyone who is into bread baking will have heard of Peter Reinhart. He is the author of seven very popular bread baking books. His first, Brother Juniper’s Bread Book, was published in 1991. When the first edition of Brother Juniper’s Bread Book was published, Peter Reinhart was living in a semi-monastic community of Eastern Orthodox Christians running a restaurant and bakery called Brother Juniper’s Cafe. The most popular item at the café was this Struan bread. Brother Juniper’s Struan is made from wheat, corn, oats, brown rice and bran. It is moistened with buttermilk and sweetened with brown sugar and honey. I have been wanting to make this bread for ages but was always put off by the ½ cup of cooked brown rice in the ingredients. Who has a ½ cup of cooked brown rice in their fridge? Then, the other day, I took stock of myself. ‘How hard is it to cook some bloody rice?’, I thought. I cooked one cup and used the left over to make a great rice salad. This bread sure does taste good. But, better still, is the aroma that filled the kitchen when it came out of the oven. Warm bread always smells divine but this was the best smelling bread I have ever come across. It took all my willpower not to have a slice. I think it must have been the caramelised honey and sugar, mixed with the usual yeasty aromas. The next time I make this bread, I am going to convert it to a sour dough (stay tuned for the post). That was always my intention but I wanted to, initially, make it as written, just to know the original. 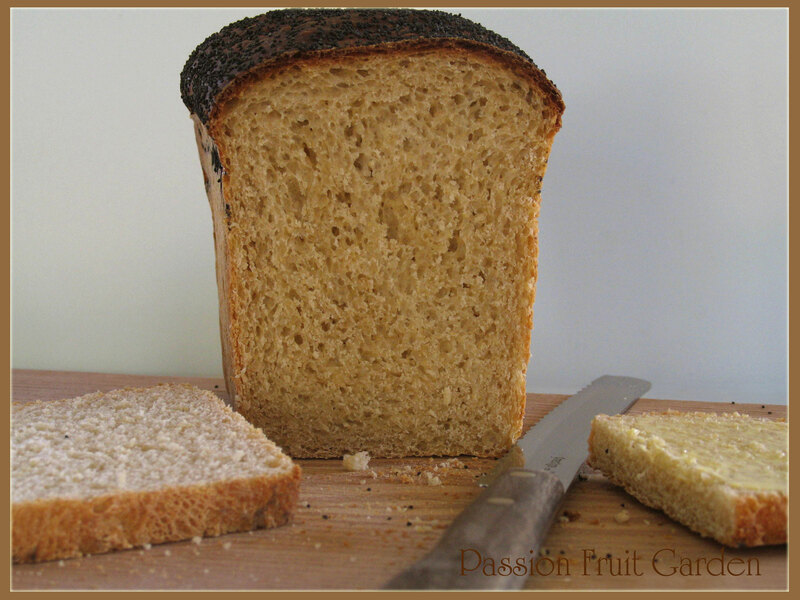 It is certainly a great bread and I love the fact that there is lots of fibre in it. It is less sweet than you would imagine with the sugar and honey, but there is a sweetness to it. It is lovely fresh and as breakfast toast. If using active dry yeast, put the yeast in 4 tablespoons* of lukewarm water and let it stand until it bubbles. In your mixer bowl or, if making the bread by hand, in a large bowl, combine the flour, polenta, oats, sugar, bran, salt and yeast. Whisk together to mix. Add the brown rice, honey, buttermilk and the water (leave a bit aside and add it when you are kneading. The exact amount of water you will need will depend on a lot of factors, including the absorption rate of the flour you are using.) Mix the ingredients to combine. Knead for 7 minutes in an electric mixer or 12-15 minutes if you are kneading by hand (Adjust the water as necessary). Peter explains that this dough takes longer to knead than most because of all the grains. Spray a clean bowl with oil and put the dough into the bowl. Cover with plastic wrap that has been sprayed with oil and water. Set aside for about 1 hour – until it has doubled in bulk. Divide it into 2 or 3 loaves. Put each loaf into a greased bread pan, seam-side down. Brush the tops of the loaves with the egg wash and sprinkle the poppy seeds on top. Cover the loaves with plastic wrap that has been sprayed with oil and water. If you have them, line your oven rack with a ceramic tile or pizza stone. Preheat the oven to 180°C. Allow the loaves to rise until the dough mounds over the tops of the pans. Bake for 45 minutes in your preheated oven. The bread is done when it sounds hollow when tapped on the bottom. I found that my bread was getting too brown on top so I took them out of the pans after 30 minutes and baked them on their sides for the last 15 minutes. 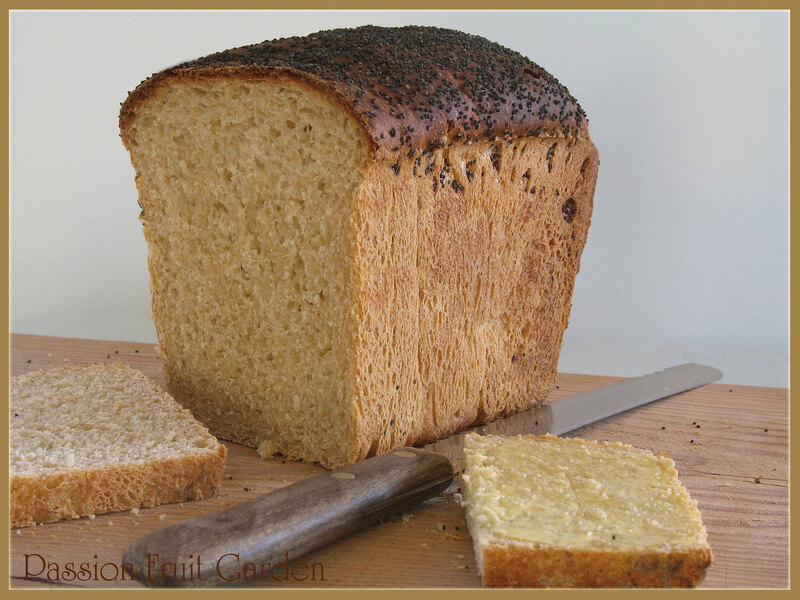 This entry was posted in Bread, Commercial yeast and tagged Bother Juniper's Bread Book, Harvest bread, Mixed grain bread, Peter Reinhart by Glenda. Bookmark the permalink. Now I know what to do with that little bit of brown rice! Ooooh, brown sugar, honey, buttermilk – sounds like my kind of bread. That is one tall loaf of bread though! Must be the yeast. Hi Diane – I think it is a very American loaf of bread. We wouldn’t normally put sugar in our bread. That sounds right since we do have a lot of sweetened breads here, especially using honey. glenda. I absolutely love the sound of this bread!!! I will definitely try it and reference you. I love that it has br. rice and bran and oats1!! it would go nicely after toasting with butter or labneh and chillies!!! I just need to get the bread flour. polenta! Glenda on a v different note you once asked about using rice flour in my arabic desert muhalabiye.. I just use corn starch in it. It is a lovely desert esp with mastic resin added. Hi Lara. I was just interested whether the were two ways to make Muhalahiye or whether they were a similar but different dessert. I always used Claudia Roden’s recipe and she uses rice flour. I think I will try your version next time and do a compare and contrast 🙂 Enjoy the bread. I hope it is as good as your bread. It certainly looks a good loaf. Seems quite a bit of salt but maybe that’s because there’s lots of sweetness. Hi Anne – 4 teaspoons seems about right to me for this much flour. It certainly was not salty. It was probably all those cup measurements that made it seem a lot (I’m a grammes person not cups). Also, I don’t think I add as much salt to my bread as some recipes. Hi Anne, It is an American recipe and they tend to use cups. If I convert it to a sourdough recipe I will also convert the cups to grams. Hi Ella. Baking bread is so much fun – go on do it. Brown rice freezes really well Glenda, so next time you cook some make extra and freeze it. Then when you want to make the loaf all you have to do is defrost the rice. I do agree with the comments on the yeast; it does seem like a lot. My normal ratio is 1 tsp/ 500g (approx) and it always works well. Hi Tania. I agree with the yeast. More modern books use much less. Think we’ll just call in one day to try it at your place. Can you imagine the mess I would make in the van trying to cook this! Hi Sue, Can’t wait until you we catch up. Interestingly enough, despite all the cookbooks I’ve accumulated over the decades, I have not heard of this writer. Your Struan bread sounds absolutely delicious, Glenda. It sure is. Thanks for stopping by and commenting. Sounds delicious, but it seems like an awful lot of yeast for just 3 loaves. Have you tried it with less yeast, and a longer rising time? I thought the same as Cea about the huge amount of yeast. I think I’ll try it with a lot less. Hi Melissa. Go for it. As I am sure you know, it will just take a bit longer to do its thing. Hi Cea. Yeah it sure is a lot of yeast. These old recipes use much more yeast than we would today and, because of that, it all happens very quickly (especially for someone who is used to sourdough). I haven’t tried it with less, but off course you could. I just wanted to make it as per the recipe before I started playing around with it. Next time I am going to make a sourdough version.